Brands are becoming less and less distinct, and there is reliable data that supports this trend. Interestingly however, the ones that break away from their categories have something common: They integrate two seemingly opposing personality traits. This hypothesis is called Brand Tensity, and we have already discussed half a dozen way of finding yours. Based on my experience, brand managers find this process very helpful and energizing. That’s said, once we discover the built-in tension of their brand, my clients often ask me the following: “This is great! But, I can’t wrap my head around how we will visualize our tension. How will we bring our brand personality to life? Does this mean that we should change our colour palette? Or should we revisit our slogan?” Today, we will discuss how you can breathe life into your brand tension. Before we go any further, let’s take a step back from the world of branding and review how we form our impressions of other people. This particular topic is the purview of the discipline called social perception, which studies how people form impressions of and make inferences about other people. Psychologists agree that we learn about others’ feelings and emotions by picking up information from a variety of sources. Social perception theory states that, when all is said and done, we pay attention to three things: persons, situations, and behaviours. The first one is about physical traits such as skin colour, height, weight, style of clothes, etc. The brand equivalent of this is your brand identity. Your web site, your product design (if any), and your tone of voice are all parts of your brand identity. Granted, the way you look and talk help make a first impression. That said, they are just one piece of the puzzle. We also form opinions about others by referring to our prior experiences. In branding terms, the consistency with which you project your brand personality is as important as your actual brand personality. Let’s take Chipotle for instance. The brand is a fast food chain, which delivers on the main category criteria such as choice, taste, and convenience. And it does that by being socially conscious. Thus its brand essence is “food with integrity.” On paper, this is a highly-differentiated brand tensity within the fast-food category. That said, for Chipotle to be perceived that way, the brand cannot solely rely on slogans, campaigns, and ads. After the food safety crisis, people will remember the Chipotle brand more by its unsafe product and less by its noble values. Going back to our previous point, how you visualize and verbalize your brand tensity is important. It is equally important if what you say you are is in line with what people already think you are. Consistency has little to do with creativity. It is mostly a matter of business strategy. Think of it this way. If I tell you that “you really look great today,” and say it while making eye contact and smiling and speaking in a friendly tone, you’ll likely take it as a compliment. If I say the same words while rolling my eyes, shaking my head, scowling, and speaking with derisive inflections, you’ll know I’m being sarcastic and critical. When we are forming opinions about others, we use nonverbal cues such as eye contact, body posture, gesture, physical contact, facial expressions, the tone of voice, fluency, and timing. As far as your brand is concerned, these would be the behaviours of your staff and executives. 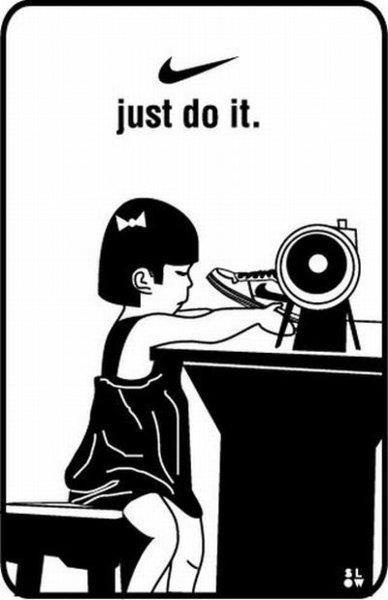 Remember Nike’s child labour scandal? That event stained the image of a powerful brand, probably forever. Likewise, when you think of Apple, can you separate the actual product from in-store experience? Not really. That shows you that brand personality is a concept that includes but not limited to creativity. While we can argue about the relative importance of such sources, we can, nonetheless, conclude that we form our impressions of others by judging what they say, how they say, and how they behave. Similar logic applies to brands as well. When people form opinions about your brand -when they are assessing their feelings about you- yes, they look at your design, they pay attention to what you say as well as how you say it. That being said, they probably pay equal attention to how you behave as a company. The nonverbal cues that your brand sends through its actions speak as loud as -if not louder- than your ads and campaigns! You shouldn’t demote the concept of brand personality to a mere creative exercise. Instead, you should look at the task in hand as a project of operationalization as well as just visualization. What you say and how you say it are important (your verbal identity.) How you look is important (your visual identity.) If you really want to have a unique brand personality, the key is focusing on how you behave. On the next article we will go over a useful exercise for operationalizing your brand tensity. Interesting. The topic helps remind me on things I readup on negotiation & body language then on advertising. I will need to dust up old files &combine new experiences to be able to comment.